Scones are great anytime, for morning coffee, brunch, or afternoon tea. Since it's the season for pumpkin recipes, what could be better than pumpkin scones with pumpkin butter? Actually, I never thought I would like pumpkin scones, but these are delish. I have to say though, what made these really special was the flavored butter. In fact, I'm gonna go get another to eat while I type this up. I started with two scone recipes I found here and here. What follows is my transmorgrified version, which turned out really scrumptious if I do say so myself. Mix together flour, sugar, spices, baking powder, baking soda and salt in a large bowl. Cut butter into small pieces and cut into flour. Mixture should look like coarse crumbs. In a separate bowl mix together the pumpkin, buttermilk and vanilla. Add to flour mixture and mix until the dough comes together (don't overmix). Transfer to a lightly floured surface and knead gently 3-4 times, and then shape/pat dough into a circle about 1 1/2 inches thick. Slice in half, and then cut each half into 3 equal pie-shaped wedges. Brush with egg glaze (1 egg beaten with 1 tbsp milk), and sprinkle with Turbinado sugar. Bake on a cookie sheet for @ 375° for 20 minutes, or until a toothpick comes out clean. Makes 6 scones. I totally failed on my last pumpkin scones recipe then I found your blog while looking for another recipe! These look great, I can't wait to try them... and I love your blog!! can't wait to try them!! All the comments see making me want some right now!! Thank you. God bless. I also think some raisins would add more sweetness to the scone. First heard of Pumkin Scones in the Book the Power of One by Bryce Courtney, where they are the favourite snack of the main character - Peekay. Not had a pumkin to play with since reading it. Now I do and will try the recipe, looking forward to it. As far as storage, I've put them in a freezer baggie and stuck them in the freezer. They were still good a month later. But to be perfectly honest, when I make these, there are seldom left-overs! 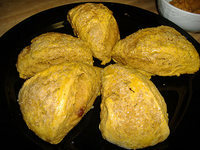 PUMPKIN SCONES Looks so delicious, each should taste if have time. Thank you all for your comments, too. I loved reading them. Since it's the season for pumpkin recipes, what could be better than pumpkin scones with pumpkin butter?
. I have to say though, what made these really special was the flavored butter. These are the best! They have been a hit with everyone that I have made them for and I have continued requests for more! Thank you! Also tried with pecans and chocolate chips just for fun...delicious! Oh God you are a genius person and a good photographer i like your pics thanks..
Has anyone tried to make mini-scones with this recipe? Do you have to change the baking time?.. I'm hooked on these punmkin scones. Has anyone tried to make mini-scones with this recipe? Do you have to change the baking time? It's my second time baking these tonight. They were a big hit the first time when I took them to a reenactment weekend and tomorrow I'm going to take some to work for the birthday of a dear coworker. Thanks for the awesome recipe! I never thought I would like pumpkin scones, but these are delish. Quite an interesting and easy recipe to make! WoW! Thanks a lot for having the recipe here. These were AWESOME!! Instead of the butter I made a glaze with powdered sugar, milk, vanilla and pumpkin pie spice. I will definitely make these again and I posted them on my blog. Thanks so much for the great recipe! Yum! Thanks so much for posting this recipe. They are fabulous! Yum, these were terrific! Thanks for sharing. Yum!! scones are fantastic, and what is more fitting the holiday than Pumpkin ones?? they sound divine!! I just made a batch of these...and they were delicious! Will definitely save this to my personal recipe collection!!! Thanks! I made these for church this morning. Yummy! I added 1/4 C toasted pecans and drizzled a powdered sugar/milk glaze first. Let set and followed with another glaze made of powdered sugar, a little molasses and a sprinkle of ginger, thinned with milk. Topped with more pecans. Decadent and wonderful! I recently found this recipe after searching for Pumpkin Scones. I made them yesterday and didn't even have a chance to make the pumpkin butter - they were gone! Great recipe!! I have been making dozens of variations on scones for almost a year now with success. The best way I find to store them is to immediately place them in foil, in sets of four, and wrap them up for the freezer. Stored this way, I only have to remove one at a time and then microwave them for 1 minute and 30 seconds at half power and they are perfectly warmed without being dried out. I will be trying this recipe also. I fell in love with Pumpkin Scones at Starbucks and these are very much the same. They are so yummy! Really easy to make. An amazing recipe. Thanks for sharing! I made these yesterday and they were delicious. Thank you! THese are yummylicious! I love the butter, as well. Hubby even liked them, and this morning I am going to offer them to the kids. Question. How is the best way to store them? I stuck them in a ziplock, and they are too moist this morning. Thank you all for your comments, too. I loved reading them. My husband loves pumpkin-flavored treats and we're approaching the fall season, so I stumbled across this recipe last week in an effort to bake up something tasty. I am not a pumpkin "fan," but these scones (with the pumpkin butter) were amazing! My husband even sprinkled a little cinnamon over the melted better for added impact and he was in heaven. Thanks for a great recipe! This recipe is an insult to pumpins as it is to scones. I don't apprcitate the chopping and mashing of my self and fellow vegetables. How can you look at yourself in the mirror knowing that you have pumpkin in your stomach? Christine! Thank you for this wonderful recipe! I make scones regularly and this has become my new favorite recipe! I made these scones last night. Of course, being one of those people that "you can give me the directions, but you cannot leave me alone with them" I made a few changes before even trying the recipe for the first time! I used 1 cup of whole wheat flour and 1 cup of white flour. Instead of buttermilk (buy 1 quart, use 1/3 cup --- I don't think so!) I used 2 TBL buttermilk powder (I use SACOs) and 1/3 c. nonfat milk. I did the whole thing in my food processor and then turned the dough onto a floured silicone mat. As I do with all of my scone recipes, I pat the dough into a rectangle and then cut it into small squares ("scone bites"). I popped the corners (the odd shaped ones ;-) into my convection oven (I have a microwave/convection oven combo over my range). I left the rest on the silicone mat and slipped that onto a cookie sheet and stuck it in my freezer for a couple hours. After a couple of hours in the freezer, I break them apart and put them in ziplock bags. On Saturday and Sunday mornings I pull out what I want and pop them into the convection oven and with no muss or fuss I have fresh homemade scones. In my freezer I have ziplock bags of cranberry/wheat, orange/ cranberry, blueberry, lemon/blueberry, wild cherry, and now pumpkin! These little scone bites are great for brunch, to share with neighbors, and especially good for fellowship after church --- a friend tried this recipe as her first attempt at making scones and called to tell me how easy they were to make! Scout, I used parchment paper on the cookie sheet. A good non-stick cookie sheet would work fine, I would think. And yes, absolutely, you could double this recipe easily. The 6 I made were actually pretty fat. You could make more from the same recipe by just cutting them a bit smaller. Jeanne, I haven't tried making these as "minis", but I would think they would cook quicker. You could shorten the cooking time by 5-10 minutes, but it's hard to be precise. Just be sure to check with a toothpick inserted into the centers. If it comes out dry, they're done! 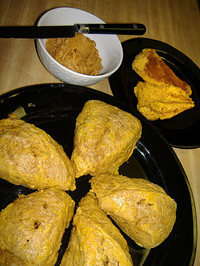 I went online to find a pumpkin scone recipe; these look absolutely fanstastic - thanks! I just finished making these, and I'm a bit disappointed. They're very bland. I like more spice with my pumpkin. I also think some raisins would add more sweetness to the scone. I did however like the texture of the dough. It was very easy to work with. Oh dear, did I forget to put in the oven temperature??? I guess I should have had more coffee before typing it up. Sorry! 375 F, for 20 minutes, but do test with a toothpick to make sure they're done!